Seven-year-old Bryce Schottel has been fighting lymphatic cancer since February. But he's got at least one superhero rooting for him. "After a scan they told us he had lymphoma in his stomach and pelvic region and an tumor in his abdomen," mom Regina Carlton told ABC News today. "They were supposed to start his fourth cycle of chemotherapy yesterday, but it appears that he has a minor infection in his lungs. He just went for a bronchoscopy to clear this infection up before he has chemo." With three rounds of chemotherapy behind him and one left to go, there's one thing that's been lifting Bryce's spirits: superheroes. "My son loves Superman," Carlton said. After seeing a photo online of Bryce, Dallas police senior corporal Damon Cole decided to do something amazing. Cole, who often dresses up as superheroes for the organization "Heroes, Cops and Kids," reached out to Bryce's family to ask if he could pay him a visit at home on April 15. "They had a Superman campaign up there for Bryce," Cole said. "I really go all out to impact the kids. My car is Superman themed, so I asked, 'Would you mind if I came up there and showed him my car and dress in my costumes?'" 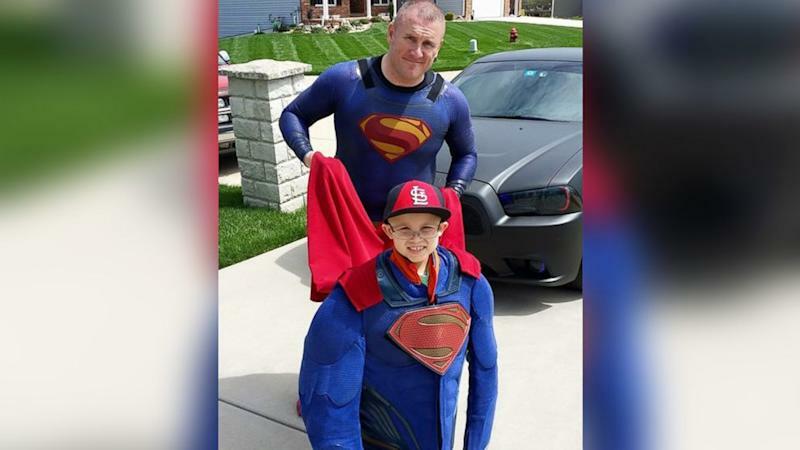 Cole then made the 11-hour drive from Dallas to Smithton, Illinois, where he surprised Bryce at his home dressed as Superman and presented him with a collector's Superman figurine. "He just ate it up," Cole said. "After that I took him outside and showed him my Superman car and he was just blown away by it. He was like 'wow, wow!'" "I told him, 'I don’t do this for everybody, but you're the superhero, not me,' and I gave him one of my capes," Cole said. Later, Cole changed into his Iron Man costume and he and Bryce ended their visit by blowing bubbles, playing cards and video games. "I wish I could say I let him beat me, but he actually did beat me," Cole said, with a laugh. "Bless his little heart, you would not know he is sick because he had such a positive attitude." "I have a 7-year-old and I don't know how they do it," Cole added. "I'm not rich, I'm not famous, I'm a nobody, but if I can bring happiness and make these kids smile, I'll do it." Cole plans to visit St. Louis Children's Hospital, so he can show up again in his Man of Steel gear for Bryce, along with other children who are patients there. "There's not a lot of people in this world that do anything like this anymore, who are so selfless and generous," Carlton said. "It was a complete stranger who made that trip to make my son smile." Bryce's family members are encouraging people to donate to cancer research and children's hospitals everywhere.